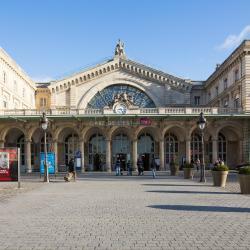 Looking for hotels near Télégraphe Metro Station? 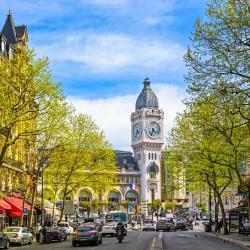 Located in the 11th arrondissement of Paris, Hôtel La Nouvelle République is a 15-minute walk from Place de la République and a 20-minute walk from the Marais district. Compact but trôp jolie! Really cute, the room. Everything is there. Absolute Hotel is located in Paris, on the edge of the trendy Canal Saint-Martin, 984 feet from Place de la République and 0.9 mi from Pompidou Center. It features a 24hour/7 reception. It was an incredibly comfortable bed. The staff were very nice and helpful. Hotel Restaurant Au Boeuf Couronné offers pet-friendly accommodations with free WiFi in Paris, a 3-minute walk from the Parc de la Villette. Guests can enjoy the on-site restaurant and bar. Location is perfect, with the metro station right infront of the hotel. Hotel Scarlett is set in Paris in the Ile de France Region, 1 mi from Place de la République. Guests can enjoy the on-site bar. Every room comes with a flat-screen TV with cable channels. The hotel was clean and looked very nice. The staff at the front desk were helpful and friendly. 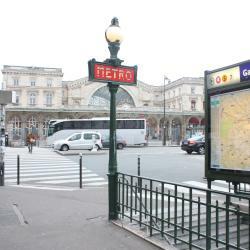 Hotels with great access to Télégraphe Metro Station! Only a few steps from the lively Place de la République and the trendy Canal Saint-Martin, Ibis Paris Avenue de la Republique offers accommodations in Paris. Guests can enjoy the on-site bar. Excellent location, unbeatable value, always clean and orderly.